MFI President Dr. Imad-ad-Dean Ahmad's article on “Muhammad on the US Constitution (as Inferred from the Qur’an and the Medina Covenant)” in Joshua B. Stein's Considering the Constitution: Commentary on the Constitution of the United States from Plato to Rousseau. This is a shorter version of an article published in the American Journal of Islamic Social Sciences. Dr. Ahmad's article on “American and Muslim Perspectives on Freedom of Religion,” published in the University of Pennsylvania Journal of Constitutional Law. MFI Program Assistant Sarah Swick's award-winning article "Modest Beginning for a Global Student Movement" imagining the rise of a student movement for liberty in the Middle East over the next four years. Dr. Ahmad's presentation on "Creating a Productive Discourse on Democracy in the Muslim World" delivered to the Center for the Study of Islam and Democracy. Dr. Ahmad's presentation on public diplomacy, "Bridging the Divide? The Role of the American Muslim Community in U.S. Relations with the Wider Islamic World" at the Brookings Institution. MFI board member Antony Sullivan gave a talk on "What Every U.S. Government Representative to the Arab or Islamic World Needs to Know" at the Foreign Service Institute. MFI President Dr. Imad-ad-Dean Ahmad's paper "Reconciling Secular Government with Islamic Law" was delivered at the Center for the Study of Islam and Democracy's Sixth Annual Conference. Dr. Ahmad's paper "The Challenge of Institutional Governance in Islam: Justice, Democracy, and Shariah" was delivered at the Center for the Study of Islam and Democracy's Fifth Annual Conference. Dr. Ahmad's paper “On the American Constitution from the Perspective of the Qur’an and the Madinah Compact,” has been published in the American Journal of Islamic Social Sciences 20 #3-4 (Summer/Fall), 105. MFI board member Maysam Alfaruqi gave a talk at the State Department on "Islam and Democracy: Possibilities, Challenges, and Risks of Bringing Democracy to Islamic Nations, Government, and People". MFI President Imad-ad-Dean Ahmad's article on "The Patriot Act" has been published in the Nov.-Dec. issue of American Muslim Magazine. MFI has a position paper on "Constitutional Protection of Private Property in Iraq". Dr. Imad-ad-Dean Ahmad's review of Noah Feldman's After Jihad: America and the Struggle for Islamic Democracy appears in Middle East Affairs Journal. Dr. Othman Ali's presentation on "The Plight of the Kurds and the Prospects for Federalism After the War on Iraq" from our sixth annual dinner is available in PDF format. Dr. Imad-ad-Dean Ahmad's article "Just Like the Rest of the World Iraq Needs Liberty" appears in the August 2003 issue of Libertarian Party News. Dr. Ahmad was interviewed by Reason magazine's Tim Cavanaugh on "Revealed Libertarianism." Dr. Ahmad's article on "The Dangers of Vouchers" published in Islamic Horizons. Dr. Ahmad's article on "The Anti-Correlation Between Democracy and Political Violence in the Experience of the Khulifah Rashidun" was delivered at conference of the Center for the Study of Islam and Democracy. The speeches of Sami Al-Arian and Merve Kavakci on the Threat of Secular Fundamentalism from our Fifth Annual Dinner. Dr. Ahmad's talk on "Definitions of Democracy" was published in the Center for the Study of Islam and Democracy newsletter, Muslim Democrat. Dr. Ahmad appeared in a Washington area radio int erview on his new book Islam and the Discovery of Freedom. Islam and the West: A Dialog book edited by Imad-ad-Dean Ahmad and Ahmed Yousef and featuring top Western analysts of Islam meeting in a round table discussion with Muslim intellectuals and activists is now available for $17.95 postpaid. Contributors include: Graham Fuller, Robert G Neumann, Stephen C. Pelletiere, Charles E. Butterworth, Michael C. Dunn, Joyce Davis, Louis Cantori, Antony T.Sullivan, and I. William Zartman. Dr. Ahmad lectured on "Building Islamic Civil Society from the Bottom Up" at the annual meeting of the American Muslim Social Scientists at Georgetown University. I. A. Ahmad 1994, "Political Economy of Liberty in the Arab and Islamic Middle East," Middle East Policy (Fall) 3 #2 (Winter), 118. I. A. Ahmad 1993, "Islam and Freedom," Religion and Liberty 3 #5 (Sep.-Oct.) 7. Dr. Ahmad gave a presentation on "American Muslim Engagement in Politics" at the annual conference of the American Muslims Social Scientists in Leesburg, Virginia on Oct. 29-31. Dr. Ahmad delivered a paper to the Istanbul Liberty Network on "Capitalism and Imperialism". Anwar Ibrahim delivered an address on The Importance of Free Markets to Islam and Muslims. Dr. Ahmad paid tribute to the work of economist Milton Friedman by exploring the role Islamic civilization played in establishing non-state schools and colleges through the civil society sector and the controversy over such institutions today in a talk called "Free to Choose Madrassas." Dr. Ahmad's plenary address on "Islam, Commerce and Business Ethics" delivered at the International Ecumenical Conference on The Ethics of Commerce delivered at the Loyola conference on Business Ethics and Spirituality was published by M.M. Scrivener in Nicholas Capaldi’s Business and Religion: A Clash of Civilizations?. Dr. Ahmad's report on property rights in Islam and their implications for nation-building in Iraq is a two-page summary of his report to the International Property Working Rights Group seeking to establish a system of property rights in Iraq after the 2003 war. Dr. Ahmad's article on Islam and Markets was the take-off point for an outstanding article by Jim Rogers in the April 1998 issue of Worth, a quality financial news magazine. An Islamic Perspective on the Wealth of Nations, a paper presented at the conference on the Comprehensive Development of Muslim Countries (Aug. 1-3, 1994) in Subang Jaya, Malaysia. Aug. 1-3, 1994. Dr. Ahmad presented a paper on The Dinar: Indispensability of Hard Money to the Islamic Monetary Regime for the Chicago meeting of the American Muslim Social Scientists on Oct. 30, 1998. Dr. Ahmad gave a presentation on "Using Early Muslim Land Tax Practice to Form an Islamic Theory of Real Property" at the annual conference of the American Muslims Social Scientists in Leesburg Virginia on Oct. 29-31. I. A. Ahmad 1994, "Islam and Economic Development: Help or Hindrance in Gaza and Jericho?" talk presented to the Washington Chapter of the Society for International Development (Feb. 8, 1994) at the World Bank, Washington, D.C. I. A. Ahmad 1993, "Islam and Hayek," Economic Affairs 13 #3 (Apr. ), 17. S. Choudhury 1995, "Eyewitness Account of Beijing Conference," New Trend 17 #9 (Nov. '95) p. 2. S. Choudhury 1995, "Reaching Toward the Horizon: From Beijing to Beyond," Muslim Journal 21 #8 12/8/95 p. 6 and 21 #9 12/15/95, p. 6. Dr. Ahmad's review of of Graham Fuller's book The New Turkish Republic: Turkey as a Pivotal State in the Muslim World was published in the Georgetown Journal of International Affairs. Sarah Swick delivered a paper on "Dubbing a Western Muslim Culture" at the 36th annual conference of the Association of Muslim Social Scientists. Dr. Ahmad's article "Common Civilizational Values as Perceived by an American Muslim" was published in Intercultural Management Quarterly. A review of Bat Ye'or's Dhimmitude published in the American Journal of Islamic Social Sciences. A review of David King's In Synchrony with the Heazvens: Studies in Astronomical Timekeeping in Medieval Islamic Civilization, Volume One: The Call of the Muezzin. Dr. Ahmad's letter to the editor on hijab is available. Dr. Ahmad's paper on "Islamic Religion and American Culture" is available. Dr. Ahmad's review of Noah Feldman's After Jihad: America and the Struggle for Islamic Democracy appeared in Middle East Affairs Journal. Dr. Ahmad's review of Caryle Murphy's Passion for Islam appeared in Middle East Affairs Journal. Our article on the Importance of Disentangling Culture from Religion for the AMSS Newsletter. Dr. Ahmad's review of Bernard Lewis' What Went Wrong? was published in Middle East Affairs Journal. Two articles by Sharmin Ahmad: "Rediscovering Qur'anic Premises for Relationships with Non-Muslims" and "Islam: Conflict or Reconciliation?" deal with Muslim-non-Muslim relations. Dr. Ahmad's lecture on "The Rise and Fall of Islamic Science: The Calendar as a Case Study," a lecture given at a conference on Religion and Science at the Al-Ahawayn University in Ifrane, Morocco is available as a preprint. The Islamic View on Adoption and Caring for Homeless Children, a chapter for the National Council for Adoption's Fact Book III. June 13, 1998 the first annual Minaret of Freedom Institute dinner was held at the Ramada Inn in Bethesda, MD. Special Guest Speaker Prof. Ali Mazrui spoke on "Islamic Dilemmas Between Human Rights and the Right to Nuclear Weapons." Transcript of Imad-ad-Dean Ahmad's Response to Howard Phillips' remarks on the topic "Because All Education is Religious, Governmnent Must Get Out"
meeting in Hawthorne, New York. Our 1999 Annual Dinner featured a talk by Omaima Abou-Bakr on "Gender Perspectives in Islamic Tradition"
Dr. Ahmad discussed Female Circumcision at a conference on Ethiopian community development. Dr. Ahmad appeared on a panel discussing "Religion and Female Genital Mutilation" at a conference sponsored by the Ethiopian Development Commission in Washington, DC. Female Genital Mutilation, MFI Pamphlet #1on the Islamic perspective on female circumcision, infibulation, and cliterodectomy. Now available in bulk at $29 for 60 copies postpaid. Send payment to: Minaret of Freedom Institute, 4323 Rosedale Av., Bethesda, MD 20814-4750. Marriage Contract in American Courts." MFI advisor Prof. Charles Butterworth's article for the Association of Muslim Social Scientists: "Blinkered Politics: The U.S. Approach to Arabs and Muslims." Dr. Ahmad's article for The American Muslim Magazine analyzes the Prospects for Iraq. Dr. Ahmad's article for The American Muslim Magazine details the role of the neoconservatives in forging American foreign policy. Dr. Ahmad's interview with Daniela Santelices of Chile's Que Pasa magazine on the War on Iraq. Letter (submitted) to The Wall Street Journal on "Old Lies About Jerusalem"
Letter to The Washington Times: Who's to Blame for the Escalation of Violence in the Middle East? Letter to The Wall Street Journal: Whose Homeland Is Palestine? Liberty Magazine has published a version of our expose on "the Real Reason to Oppose Aid to Israel" that reveals the ugly collectivist objectives of the Israeli persecution of the Palestinians. Dr. Ahmad participated in a delegation of American Muslims participating in the "First Conference on Jerusalem" in Beirut which will establish a new organization dedicated to the liberation of Jerusalem. MFI joins Christian and Jewish analysts on the failure of the Oslo Peace Process. See also press release on the torture of an American citizen. Dr. Ahmad's review of Karen Armstrong's book Jerusalem appeared in the Summer-Fall 1997 issue of Journal of Middle East Affairs. Dr. Ahmad debated Israeli journalist Avinoam Bar Yosef regarding Israeli policies on National Empowerment Television's national cable program "World Wise." Dr. Ahmad's 1996 letter to the editor exposing the real problem's behind Netanyahu's tunnel opening was published in the Washington Times. Letter to The Wall Street Journal: Sudan: Who Dug Up the 'Hard Evidence'? Dr. Ahmad was interviewed on the NewsHour with Jim Lehrer about the Pope's visit to Syria. S. Choudhury 1996, "Hamas and Hysteria," The Wall Street Journal 227 #61 (3/27/96) p. A23. 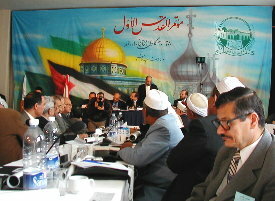 The "First Conference on Jeruslaem" pictured at left was convened in Beirut to establish a new international organization for the liberation of Jerusalem. MFI President Imad- ad-Dean Ahmad addressed the conference on the need for Muslim goups to speak to the non-Muslim world with the same openness and candor with which they speak to one another. Dr. Imad-ad-Dean Ahmad and Alejandro Beutel's article "U.S. Foreign Policy, Not Islamic Teachings Account for al-Qaeda’s Draw" appears in The American Muslim. Alejandro Beutel produced a background paper for the the Muslim Public Affairs Council on "Radicalization and Homegrown Terrorism in Western Muslim Communities: Lessons Learned for America." MFI's denunciation of the attacks of Sept. 11 and earlier denunciation of Osama Bin Ladin's contempt for the rule of law. Islam Demands a Response to the Terror of September 11 , a paper published in the Midle East Affairs Journal offered in PDF format. Dr. Ahmad's Islam Online articles Under Attack (Sept. 12, 2001) and A War Against Whom? (Sept. 26, 2001). Dr. Ahmad's review of John Cooley's book Unholy Wars: Afghanistan, America, and International Terrorism appeared in the Journal of Muslim-Christian Relations. Dr. Imad-ad-Dean Ahmad delivered a paper on "Grand Jury Abuse in the Service of Islamophobia" at the 36th annual conference of the Association of Muslim Social Scientists. Alejandro Beutel delivered a paper on “Breach of Law, Breach of Security: A Muslim American Analysis of US Counterterrorism Policies” at the 36th annual conference of the Association of Muslim Social Scientists. Sami Al-Arian and Merve Kavakci spoke at our Fifth Annual Dinner on the Threat of Secular Fundamentalism to civil liberties in Turkey and in the United Statesof America. Letter (submitted) to Wall Street Journal a rebuttal to Daniel Pipes and Steven Emerson's Wall Street Journal Article that called for the shutting down of Islamic web sites. The rebuttal date was 9/9/2001. Dr. Ahmad was interviewed by Ejaz Akram of Islam Online on privacy in Islam. Dr. Ahmad gave a lecture on Religious Liberty and Secret Evidence at the Libertarian National Convention in Anaheim. A shorter version on Secret Evidence was cablecast by C-SPAN. Letter (submitted) to Wall Street Journal on "Scalia and Religious Freedom"
Press release on the background and cricumstances of the arrest of Jamil Al-Amin. Our 1999 Annual Dinner featured a talk by Avis Asiye Allman on "Religious Freedom in Turkey." Drs. Sami Al-Arian, Imad-ad-Dean Ahmad, and Merve Kavakci answer questions at the MFI Fifth Annual Dinner. Dr. Imad-ad-Dean Ahmad spoke out on secret evidence laws at the National Libertarian Convention. Dr. Ahmad's paper on "Alternatives to Violence in Muslim History." Many topical articles at the list of Dr. Ahmad's columns at the Islam-online website. A compilation of all our Op-ed pieces and our press releases. Islamic Horizons published condensed versions of Dr. Ahmad's talks on "Using PICS for Authenticating, Certifying and Filtering Islamic Sites" and on "Necessary Elements in an Islamic Moonsighting Website." in June 1998. Charitable Remainder Trusts, a brochure on how to donate assets and still benefit from the income! ©copyright Minaret of Freedom Institute. Web design support by Teri Murphy.